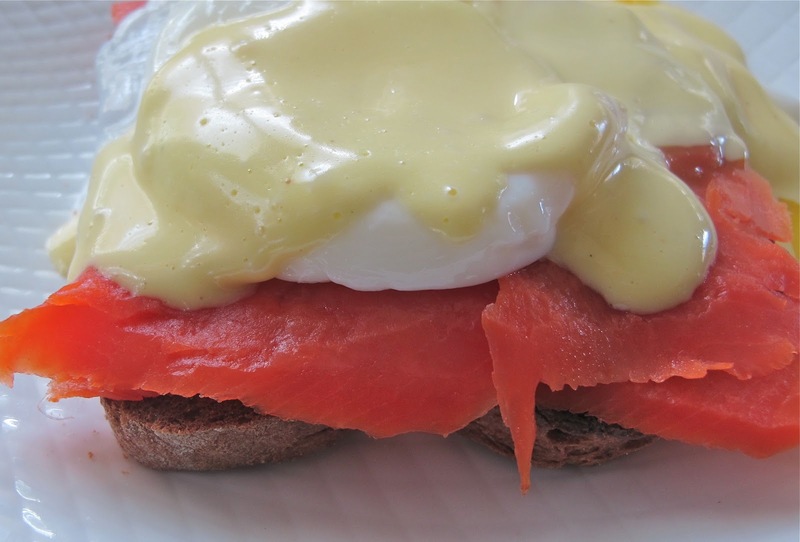 Luscious, lemony, creamy, dreamy Hollandaise sauce. My family requires it Christmas morning for their Eggs Benedict. It elevates any dish to festive status. Serve over roasted asparagus, or broccoli. Spooned on top of poached salmon or steak garnished with crab. Place egg, cayenne, mustard, 1 T. of lemon juice, salt and pepper in a blender and mix on low speed until combined. In a saucepan, heat butter until melted and hot, but not brown. With the blender running on high, slowly add melted butter in a stream until fully combined. 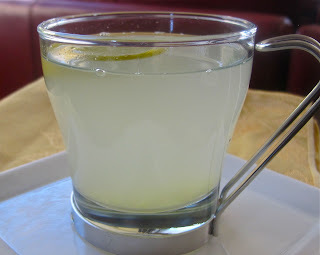 Taste and add more lemon juice if desired. Great with a salad for lunch or as a side for dinner. Prick sweet potatoes all over with a knife. Cook potatoes in microwave on high for 2-3 minutes (this will quicken the cooking time in oven). 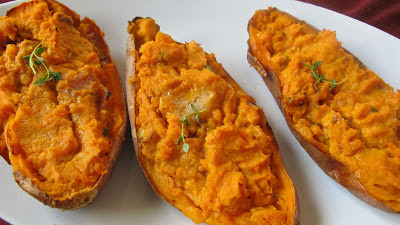 When potatoes are cooked and tender, take out of oven and slice in half. Scoop out most of the flesh, leaving about 1/4 inch to keep potato skin edge firm. In a bowl combine potato flesh, goat cheese, thyme, bacon, sour cream, green onion, salt and pepper, and garlic if using. Spoon back into skins and dot with butter. With fresh fall apples this makes a hearty, healthy lunch. This recipe is taken from Simply Delicious the Costco Way. Place tuna in a bowl and stir in mustard, mayo, celery and onion. Set aside. Slice off the top quarter of each apple. Cut a slice from the bottom, so they stand level. Rub the cut apple, as well as the slices, with lemon to keep from browning, set aside on paper towel to dry. Core the apple and discard. With a spoon, carefully carve out the inside of the apples, continue to scoop out flesh, working toward the skin, leaving about 1/2 inch edge. Dice the apple trimmings and add to the tuna mixture. Add salt and pepper and mix well. 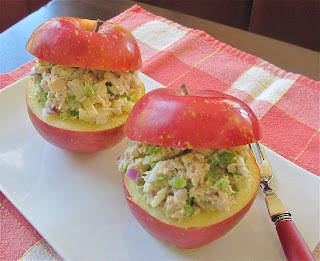 Fill each apple with the salad mixture and cap with the stemmed apple tops. Note: Bake says this would be good with a Bartlett or Asian Pear. Also with the addition of walnuts. Beat whip cream until it forms soft peaks. Set aside in fridge. Mix together pumpkin, cinnamon, ginger, nutmeg, brown sugar, vanilla and maple syrup until combined. With a mixer, add cream cheese and beat until well blended. Place 3 Tablespoons of ginger snaps into individual serving sups. Crumble more ginger snaps on top. 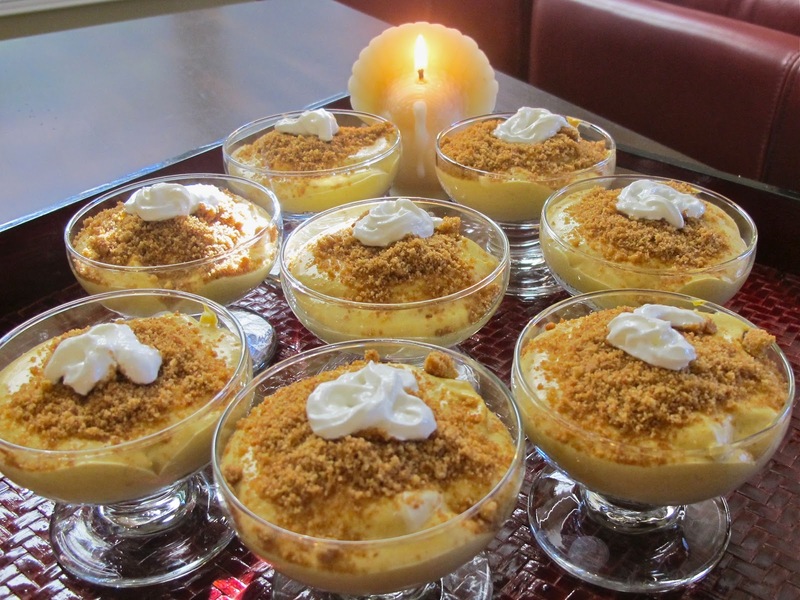 Garnish with more whipped cream or ginger snap cookie. It is Thanksgiving day and football is on, nuts are the perfect snack. This recipe was created by the Union Square Cafe in New York. 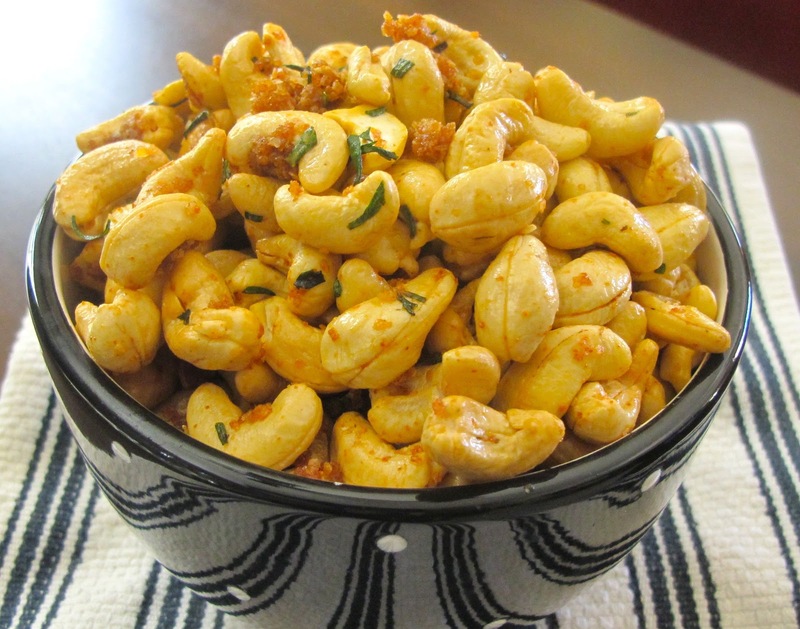 Place nuts on an ungreased baking sheet for 10 minutes, and bake until warmed throughout. Meanwhile, in a large bowl combine rosemary, cayenne, brown sugar, salt and melted butter. Toss nuts into bowl and coat evenly. Luckily, this sauce lasts for days and can be made ahead for Thanksgiving and put aside in the fridge. There are many recipes calling for a variety of spices and nuts but Bake loves this one. 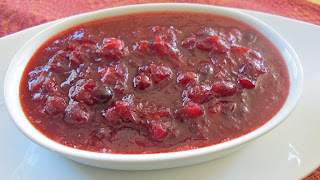 Along with turkey on Thanksgiving and sandwiches that follow, this cranberry sauce is also good over yogurt for a breakfast change. Place cranberries, sugar and orange juice in a saucepan over high heat until mixture comes to a boil. Lower heat and simmer until cranberries start to pop. Cook about 10-15 minutes. 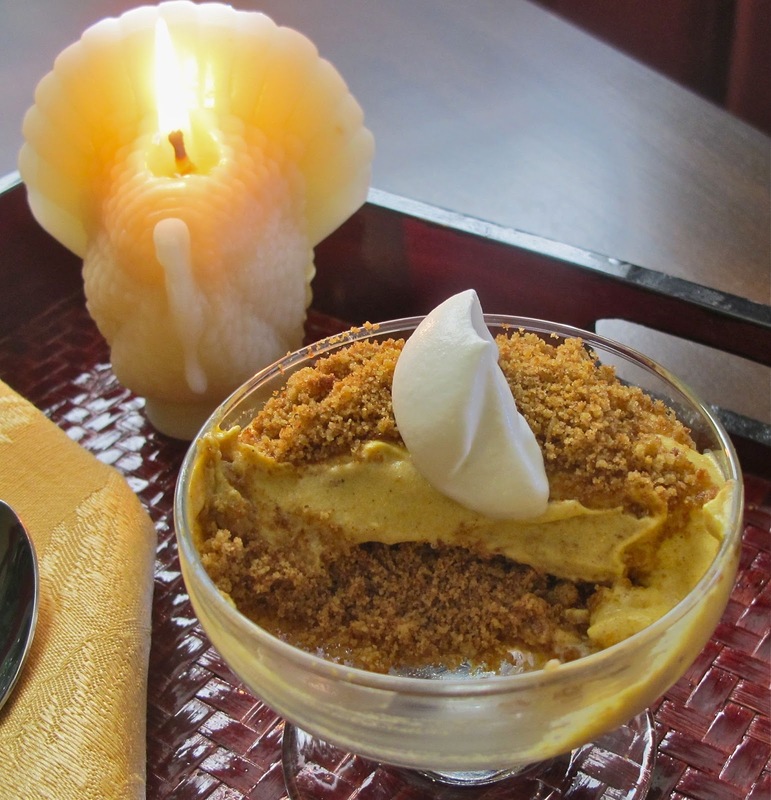 This is one of our families favorite side dishes for Thanksgiving. Along with turkey, it works well with roast chicken or pork tenderloin. I use to make a raspberry sauce but found it quicker to use a seedless raspberry jam. In a medium size pot, combine carrots, 1 teaspoon sea salt, 1 Tablespoon brown sugar, and 1 Tablespoon of butter. Add water to cover carrots and heat to a boil, cook until carrots are tender. Drain carrots and puree in food processor with 1 Tablespoon butter, sherry, cream and 1 Tablespoon sea salt. 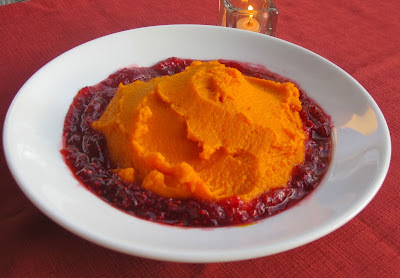 Mound pureed carrots in the middle of serving dish. Rim the dish with raspberry jam. For a break from coffee or tea, this soothing "tea" is actually good for you! Grate the fresh ginger into a cup. Fill with hot water and allow the ginger to steep for a minute. The holiday season is approaching, along with the festivities come large meals and cocktail parties. So, in the near future, eating a little lighter is in order. Bake walked in the kitchen as I was finishing up the soup and asked if there was Pancetta in it? No. Cheese? No. Sour cream? NO. I am not sure he grasp the concept. But, he did enjoy the soup. Heat olive oil and butter in a large pot over medium heat. Add carrot, onion and celery and saute until onions are soft, about 6-8 minutes. Add broccoli and stir. Season with sea salt and pepper. Add stock and water and bring to a boil. Lower heat and simmer until broccoli is tender. 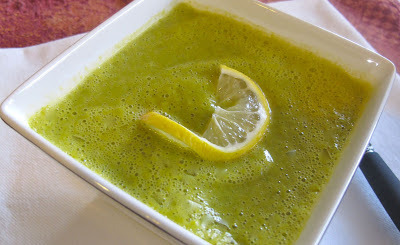 Add lemon juice and puree soup in blender (in batches) until smooth. 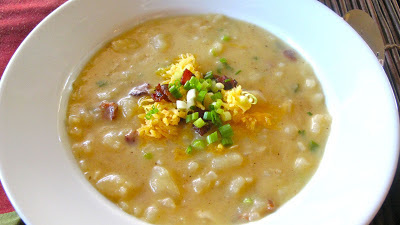 Looking for comfort food on a chilly evening? Baked Potato Soup will deliver. Scoop out insides of baked potatoes and set aside. In a large stock pot, cook bacon over medium heat. Remove bacon and drain all but 1 tablespoon of fat. Add 2 tablespoons of butter to stockpot. Stir in shallot and onion, cook until soft, add garlic. Add 3 tablespoons of flour and cook 1-2 minutes. Add 4 cups of chicken stock, cooked potatoes, and a dash of hot sauce. Cook over medium heat until heated throughout. Stir in cooked bacon (saving a little for garnish) cheddar cheese, and green onion. Stir well. Serve and garnish with bacon, cheddar cheese and green onion. This is the recipe that Bake is famous for. He usually makes it in a 9x13 inch glass baking pan or any 8 cup baking dish. Today, I made it in individual ramekins. Store bought dough is what he uses, or you could use any pie dough. I use store bought puff pastry. With leftover dough, you can cut out shapes to make a design on top. 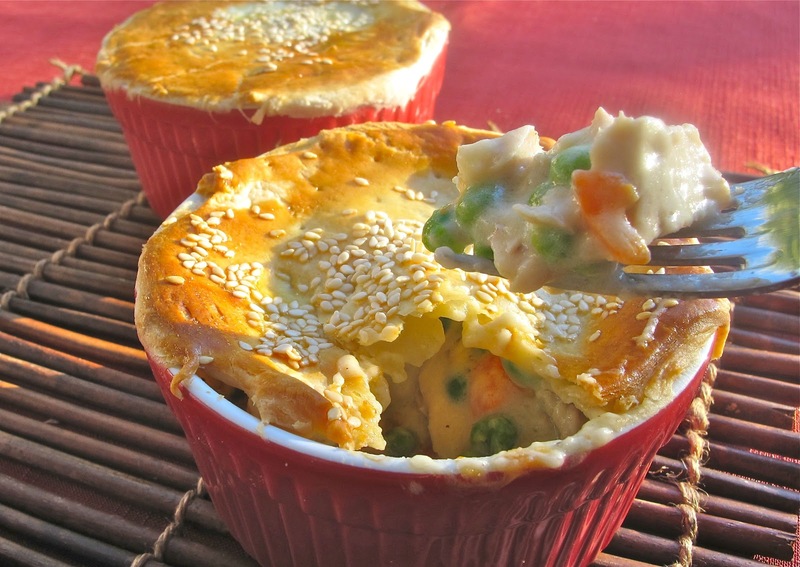 Combine chicken, carrots, peas and veloute sauce. Place in a greased 8 cup baking dish. Cover with pastry dough. 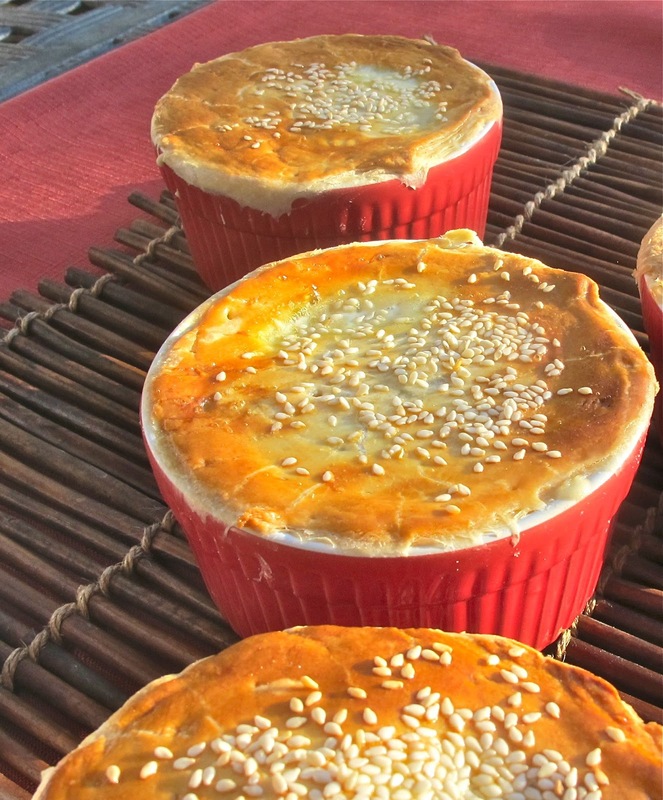 Combine egg with water and brush over pastry dough. Sprinkle with sesame seeds. Melt butter, blend in flour and cook. Add milk gradually, stirring constantly, add chicken stock, season with salt and pepper. Bring to a boil. Reduce heat and simmer 5 minutes. When we use to have a full house, Sunday night dinner was roast chicken. 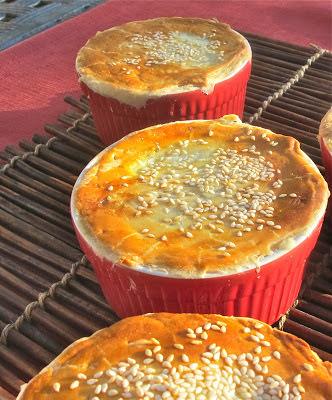 I would roast 2 of them and then use the leftovers during the week, on top of salads, in sandwiches for school lunches, curried appetizer (used in a previous post) or for Bakes chicken pot pie. Later Sunday evening, while everyone was preparing for the week ahead, I would take the carcass of the chicken and make stock, to use for soup or sauces during the week. Remove giblets and neck from cavity. Wash and dry chicken, inside and out. Season inside with Alfies, and then stuff with 1/2 of the lemon, herbs, 1/4 of onion and half of the garlic. Line the bottom of roasting pan with chopped carrots and the remaining onion, sliced. Place stuffed chicken on top of vegetables. Brush chicken with olive oil, juice 1/2 lemon over top and sprinkle on seasoning and remaining garlic. Truss the legs together with twine and turn wings under. Roast chicken for about 1 1/2 hours until juices between thigh and breast run clear or until thermometer reads 165F at thickest part of meat. Remove from pan with tongs to a carving board and let sit for 10-15 minutes before slicing. Note: Vegetables can be served along side chicken and drippings can be used for gravy. This dish can be put together in minutes, for a quick lunch or dinner. 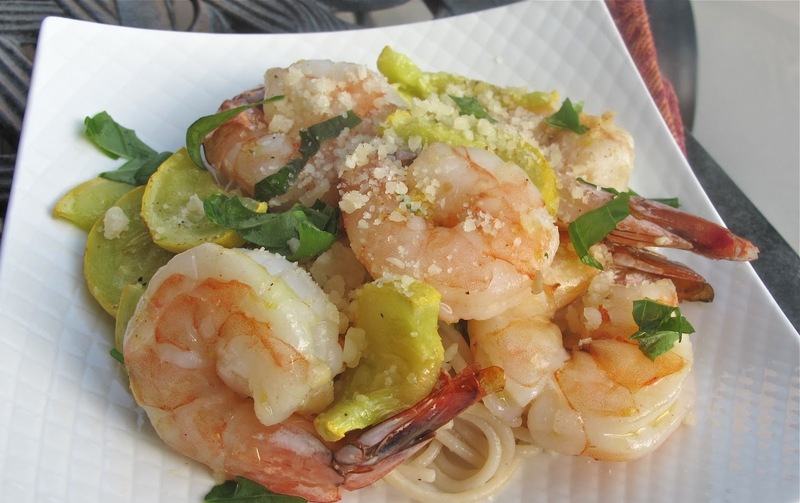 Mix shrimp, garlic, lemon zest, and seasonings in olive oil and scatter on a parchment or foil lined baking sheet. Bake about 10-15 minutes until cooked. Slice zucchini in rounds and put on separate baking sheet with a sprinkle of Alfies seasoning. Toss cooked shrimp with lemon juice. Sprinkle with basil and parsley. Add zucchini and put over cooked pasta (or rice). Top with grated Parmesan.